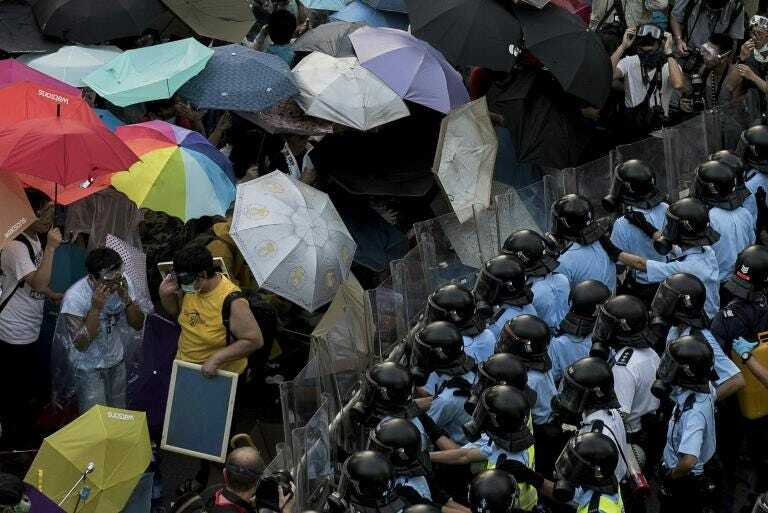 October 1, 2014 -- The Bullet (Socialist Project, Canada), posted at Links International Journal of Socialist Renewal with permission -- The largest student demonstrations and occupations in Hong Kong's history are unfurling in what is increasingly being called the “Umbrella Revolution”, in reference to the sea of umbrellas being used as cover against both pepper-spraying riot police and the rays of the sun. It began as a Hong Kong-wide class boycott on September 22, with around 10,000 university and college students congregating on the Chinese University of Hong Kong campus for speeches and lectures on civil disobedience. Moving across town to a sit-in on September 24 in front of the main Hong Kong government buildings in the district of Admiralty, by the night of September 29 it had morphed into an unprecedented occupation of four major districts in Hong Kong involving at least 80,000 people, predominantly students. New York City, September 21, 2014. September 24, 2014 -- First published at TeleSUR English, submitted to Links International Journal of Socialist Renewal by the author -- The world’s largest ever march against climate change on Sunday, September 21, brought 400,000 people to the streets of New York, starting a lively parade at Central Park. On Tuesday, September 23, 120 of the world’s political leaders – notably not including China's and India's – gathered 25 blocks away at the United Nations. The message they got from society was symbolised by the march route: instead of heading towards the UN building, the activists headed the other way, west. This directional choice reveals that hope for action on climate change comes not from the apparently paralysed heads of state and their corporate allies, who again consistently failed on the most powerful challenge society has ever faced: to make the greenhouse gas emissions cuts necessary to halt certain chaos. Instead, momentum has arisen largely from grassroots activists, even those fighting under the worst conditions possible, amid denialism, apathy, corporate hegemony, widespread political corruption and pervasive consumer materialism. February 26, 2014 – Links International Journal of Socialist Renewal -- This volume consists of eight interviews given by Noam Chomsky to David Barsamian in 2010-12 (in fact six of them were given in 2012). As always, Chomsky’s insights into politics and power are penetrating and insightful, and cover a wide range of topics, including the Arab Spring, Wikileaks and Bradley Manning, the role of social media like Facebook and Twitter in the atomisation of society, the Obama administration, and a host of others. As is usual in Chomsky’s books, every factual claim he makes is meticulously referenced in notes at the end. North Carolinians mobilised against an anti-worker (and anti-woman, anti-civil rights) legislative assault by bringing thousands of protesters to the state capitol every week for “Moral Mondays”, with close to a thousand arrests. Photo by Ajamu Dillahunt. December 30, 2013 -- Labor Notes -- Lean meanness stalked workplaces. The political and economic outlook continued dismal. But the year was marked by workers trying new things and setting higher standards, for their employers, their unions, and—in the case of low-wage workers—their pay. Unemployment ticked down slightly, but the jobs created paid worse than ever. Mainstream media reported with amazement that jobs that once paid the bills, from bank teller to university instructor, now require food stamps and Medicaid to supplement the wages of those who work every day. California Walmart worker Anthony Goytia spoke for many when he said it’s no longer pay cheque to pay cheque for him and his co-workers, but payday loan to payday loan. December 16, 2013 -- Socialist Worker (USA) -- There is a lot of debate among socialists in the United States about just how to engage in this country's rigged electoral game, if at all. In a time when the revolutionary left is numerically small, some socialist groupings have made a fetish out of participating in elections, local and national, in attempts to realise their ambitions of becoming the party of the US working class all by themselves. Others have made a fetish out of not engaging in any kind of electoral work for lack of a viable mass workers' party or else as a permanent boycott of the objectively pro-capitalist electoral system in the United States. KEXP Interview with Kshama Sawant. Links International Journal of Socialist Renewal congratulates Kshama Sawant and US Socialist Alternative on their important and inspiring success in the Seattle City Council election. For more on socialists in municipal councils, click HERE. November 15, 2013, Seattle, Washington -- Vote Sawant -- Today’s King County elections ballot count saw the Socialist Alternative candidate for Seattle City Council, Kshama Sawant, pulling further ahead of 16-year Democratic Party incumbent, Richard Conlin. The socialist candidate has now won 88,222 votes compared to Conlin’s 86,582. After today’s count was released, Richard Conlin announced he was conceding the race. August 30, 2013 -- Green Left Weekly --Ender Imrek is a member of the Taksim Platform, the key organising centre during the Gezi Park protests. He is also former vice-president of the revolutionary socialist party Labour Party-Turkey (EMEP) and a central executive member of left-wing umbrella group the People’s Democratic Congress (HDK). Can you tell us about the HDK? The HDK formed in October 2011. It was preceded by a progressive electoral bloc (the Labour, Democracy and Freedom Bloc), which got 36 candidates elected to the 550-seat national parliament despite harsh repression and electoral fraud. Most of our MPs were elected in the Kurdish region. We also won three seats in Istanbul, and one each in Mersin and Adana, where there is a Kurdish population concentrated outside the Kurdish region. The football supporter group "Çarşı" from Beşiktaş entering Gezi Park. Çarşı is at the forefront of the street battles, building on long experience of political activism and social mobilisation. Image by Kerem Öktem. June 4, 2013 -- Jadaliyya -- More than 10,000 people took over the streets of Ümraniye, a working-class neighbourhood on the Asian side of Istanbul, at around 10 pm on Sunday June 2 to stand in solidarity with the demonstrators not only in the grounds of the Gezi Park in Taksim Square, but also with those demonstrating in 67 cities all over Turkey from Ankara and Izmir, to Adana and Hatay. Gathering on the main avenue of the May 1 Mahallesi (district) of Ümraniye, a neighbourhood always imagined as a stronghold of AKP politics and home to a socially conservative lifestyle among the diverse districts of Istanbul, over 10,000 Ümraniye locals marched onto the main artery of Istanbul’s highway system connecting the European and Asian sides of the city via the Bosphorus Bridge, known as TEM in Turkey. June 4, 2013 -- Real News Network -- Today the uprisings witnessed a new development, when Turkey's Confederation of Public Workers Unions, KESK, consisting of 11 unions and approximately 240,000 members, declared their decision to stage a massive two-day strike. The action, which was originally planned for a later date in response to labor law modifications, was rescheduled to June 4 now, in response to the government's excessive use of police brutality and its increasingly undemocratic practices. For the full transcript, click HERE. June 2, 2013 – Links International Journal of Socialist Renewal/Green Left Weekly -- When the humble “Occupy Gezi” (Occupy Promenade Park) protest in Istanbul’s Taksim Square was brutally attacked on May 31 by police and spread like wildfire throughout Istanbul and into other cities, the Turkey’s left was in the thick of it. May 19, 2013 -- Lenin's Tomb, posted at Links International Journal of Socialist Renewal with permission -- Speech presented at the Subversive Festival in Zagreb. Striking Chicago teachers rally, October 2012. December 31, 2012 -- New Politics -- The most important social conflict in the United States in 2012—the Chicago Teachers Union strike—suggests that the rising trajectory of social struggle in the United States that began at the beginning of 2011 may be continuing. While the United States has a much lower level of class struggle and social struggle than virtually any other industrial nation—few US workers are unionised (only 11.8%) and unionised workers engage in few strikes and those involve a very small numbers of workers—still, the economic crisis and the demand for austerity by both major political parties, Republican and Democrat, have led to increased economic and political activity and resistance by trade unions, particularly in the public sector. July 25, 2012 – ESSF, posted at Links International Journal of Socialist Renewal with Paul Le Blanc’s permission -- Paul Mason is one of the best journalists covering the global economy today. His book, Live Working, Die Fighting: How the Working Class Went Global, is an essential resource for anyone concerned about the workers’ struggle against oppression and for liberation in the past, present and future. I met him while I was in thick of Pittsburgh’s G20 protests, which he was covering for the British Broadcasting Corporation (BBC). 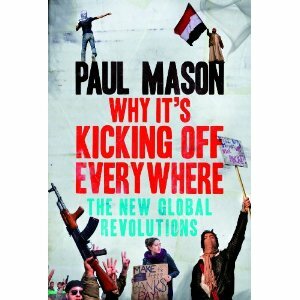 I had already read his splendid book (which I was using in one of my courses) – and his front-line television reportage of the protests and the realities generating them was outstanding. Russia since the elections: the calm before the storm? 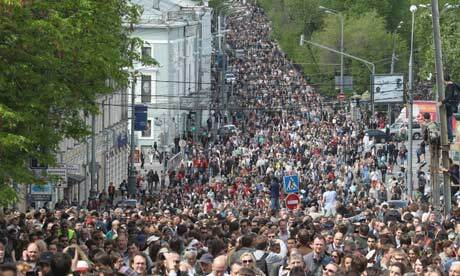 More than 15,000 protesters marched from Pushkin Square to the Chistye Prudy metro station in Moscow on May 13, in support Occupy Abay. Photograph: Sasha Mordovets/Getty Images. May 30, 2012 – Links International Journal of Socialist Renewal -- In Russia, the winter of 2011-2012 was unusually stormy in the political sense. The results of both the parliamentary and presidential elections were clearly worked out in advance, and everything went as foreseen. Both the United Russia party and President Vladimir Putin were confirmed in power. But the meetings and demonstrations of many tens of thousands of people that took place regularly in Moscow and elsewhere over months placed this order and simplicity in doubt. At the request of the author, Links International Journal of Socialist Renewal is happy to make available a new pamphlet produced by radical Occupy activists in United States, in the interests of the advancing discussion in the movement. The pamphlet can be downloaded free HERE (in PDF) or you can read it on screen below. Who would’ve imagined the word “occupy” would inspire millions to take direct action and stand up for the 99% here in America after brutal occupations in Iraq, Afghanistan, and Palestine? Now there’s Occupy Pakistan and even Occupy Nigeria. Occupy is more than a movement, less than a revolution, and long overdue. Occupy isn’t about ideology, it’s about the 99%, hence why pacifists and insurrectionists, anti-capitalist anarchists/socialists and pro-capitalist libertarians, liberal Democrats and Ron Paul Republicans, vegans and omnivores have come together despite our differences. April 18, 2012 -- Links International Journal of Socialist Renewal/Green Left Weekly -- The Coalition of Free and Fair Elections (called Bersih – meaning “clean” in Malay), a civil society movement for free and fair elections in Malaysia, has called for a mass sit in on April 28 because it suspects that the country’s entrenched Barisan Nasional (BN) government is about to call a general election before addressing widespread electoral irregularities confirmed by a review forced on the government by the previous Bersih 2.0 mass mobilisation on July 9, 2011. The Bersih 2.0 mobilisation was banned by the government, which set up roadblocks around the capital Kuala Lumpur, carried out pre-emptive arrests of activists and tried to ban the wearing of yellow clothes, the colour used by the movement. Yet on the July 9 some 50,000 defied the riot squads, tear gas attacks and 1600 arrests and took to the streets. March 6, 2012 -- Paul Le Blanc is professor of history and political science at La Roche College, Pittsburgh. He is the author of a number of books on revolutionary and radical politics, most recently Marx, Lenin and the Revolutionary Experience and Work and Struggle: Voices from U.S. Labor Radicalism. 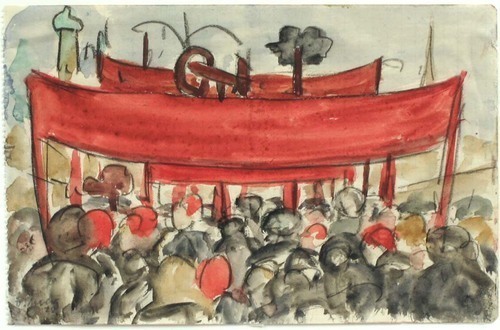 He spoke to Ed Lewis about the Get Political campaign, which aims to bring radical activists of today into critical engagement with the ideas of Lenin, Trotsky and Rosa Luxemburg. Ed Lewis: What is the "Get Political" initiative? February 23, 2012 -- Fifty key figures on the left including Ian Angus, John Riddell, Patrick Bond, Paul Le Blanc, China Miéville, Ken Loach, Lindsey German, Alex Callinicos, Suzi Weissman, Michael Yates and Immanuel Ness have backed a Pluto Press campaign urging activists fighting for the 99% to draw inspiration from the lives and writings of three giants of 20th century political change: Leon Trotsky, Rosa Luxemburg and VI Lenin. The "Get Political" campaign statement (see below; also at www.getpoliticalnow.com) contends that "it will not be a simple thing to win the battle of democracy ... Luxemburg, Trotsky and Lenin were among the most perceptive and compelling revolutionaries of the 20th century. The body of analysis, strategy and tactics to which they contributed was inseparable from the mass struggles of their time. Critically engaging with their ideas can enrich the thinking and practical activity of those involved in today’s and tomorrow’s struggles for a better world."